Ohmygoodness. This stew is exactly as good as it sounds in the book. Where to even begin describing it? The vegetables are wonderful, and add a welcome splash of color that is absent from many seafood chowders. Your brain will think the turnips are potatoes, and the sliced leeks separate in the mix such that every bite is bursting with both veg and fish. Despite the vast quantities of fish that went into the stew, it did not taste overly fishy. Instead, the seafood flavors melt into the creamy broth, mingling with the aromatic garlic and the very subtle hint of saffron. We served ours in a loaf of black bread, which adds so many additional complex flavors that we found ourselves spooning up more and more to try and experience them all. Definitely a keeper, and a must try recipe that’s now in the cookbook!! Ha – Read this passage this morning. Looks just as I pictured it in my head. Hope there’s a cook-book I can buy my wife coming out one day, your recipes are fab! OMG, this looks wonderful!! I MUST make it!! It was fun to read A Dance with Dragons with your project in mind – don’t know if you’ve finished it yet, but I think George may have included some unprecedented foods in the most recent book just to challenge you. I’m especially looking forward to the sugar skulls with plummy-custard brains! While the stew looks amazing, I definitely didn’t appreciate the spoiler that [spoiled!] lives in Dance. In FoC it’s said he’s killed. I apologize if we spoiled that for folks; his chapter comes fairly early in the book, so I figured it was reasonably safe. We will try to be more mindful in future posts! It’s not really a spoiler since the first part of Dance happens at the same time as the first part of Feast, and in Feast he’s reported dead later in the book, so it’s entirely possible he dies later in Dance. I assume that when you say “add chunks of fish” that it includes the clam and crab as well? Yay!!! This sounds soooo freaking good. I making this tonight. Maybe it’ll convince my boyfriend to read the books! PS: Thanks for responding so quickly by email to my questions. You are truly goddesses, both of you! Not necessarily a spoiler, as Feast for Crows takes place at the same time as A Dance with Dragons. I’m surprised you didn’t touch on Tyrion’s alternate recipe, “Singer’s Stew”. Very pleased to see you get this up so fast! I don’t think it’s going to make my dinner party (seems like the perfect winter dish, not so much for the dog days of summer), but I can’t wait to try it for myself. My mouth waters just going down the recipe list. SPOILER!! DON’T LOOK IF YOU HAVEN’T READ IT ALL!! Of course, you already have lovely pie recipes here! This was SO tasty. :) Yes, I’d agree that it’s more of a winter dish, but since one of my favorite foods on earth is New England clam chowder, I couldn’t wait to make this – this was very reminiscent of a good chowder, but distinctly different at the same time. Since I haven’t made bread in a million years, I used the more basic “Crusty, fresh-baked Bread” recipe posted here for bread bowls instead of the Black Bread recipe, and it still worked really well. Love the site… thanks for the awesome recipe! I stumbled across this site today and holy cow, you guys are awesome! I literally just got home from the store buying all the ingredients because I’m making this tomorrow, but I had a quick question before I do: In your description, it first says add 1/2 lb of fish to make the stock…do I just save the other 1 lb to throw in with the clams/crabs later? Correct! The 1/2 lb. serves to make some fish stock, but at the end that fish and the other all get added into the mix. Hope you love it! If you live in a town with a Bread Smith store I would recommend them as having above average crusty european style breads of barring that try Panera bread. When/where does the 1 8 oz bottle of clam juice go in? It doesn’t! :) That was leftover from the recipe we based ours on, but in the end we decided we didn’t need it. Sorry about that! Made this last night with a friend, it is intensely good! Honestly, I thought it was even better the next day. You’re not kidding about the different flavors – every different bite is the carrot, the leek, the cod…though my favorite part was unexpected, the BARLEY! It’s sooo tasty in there. I read this passage in aDwD and thought of you guys INSTANTLY – you didn’t disappoint! I thought this was the most delicious-sounding meal in all of Dance! I’m interested to hear other suggestions, but I think it would be good if you combined it with our other seafood stew, from the Quiet Isle. That has three kinds of fish, including salmon, which gives it a wonderful flavor. The rest you can keep as is, barley, leeks, and all! I’ll check out the recipes and see what I can come up with. I’ll be sure to post back here with the results of my endeavor whenever I actually have time to make it happen. Thanks so much for the advice! Thanks for the link! I’m always looking for ways to substitute shellfish in recipes! Much appreciated. This recipe looks nice! Can I substitute the pearl barley? I live in Asia and we don’t have it in our markets / grocery stores. I saw a lot of dried barley in jars though, will that work? Yes, that should work. Good luck! Hi! So, say you’re not really a seafood/crab person, but other than that this stew looks to die for. Could you potentially use other meats(like beef/chicken/turkey/veal/etc) as a substitute? If so, which one? Thanks! For a cream and butter broth, I’d say poultry. but the ladies might have a better idea! I’d agree with duckchick and say some sort of poultry would be a nice substitute for the seafood. Let us know how it turns out! I have wanted to eat this since I read it in DwD, but I want to make it for my boyfriend. He introduced me to ASoIaF. Apologies for the silly question, but your recipe calls for “white wine”. Will any white do? A Sav. Blanc, maybe? Can’t wait to cook this beauty up! Cook’s Illustrated tends to recommend either a Sauvignon Blanc or a basic dry Vermouth (not sweet) if you’re going to cook with white wine. They reduce well and “play well” with other flavors. Chardonnays, Rieslings and Pinot Grigio’s are acceptable, but either added too much or too little flavor profile. “Cooking Wine” is a no-go because it contains salt. I tried out this recipe there but i had a few differences to what you had due to lack of supplies. i didnt have the barley so i subbed in oats and instead of clam meat i had mussels. i also threw in some smoked salmon because i love Irish smoked salmon (being from Ireland). The flavour was amazing and the taste blew me away. I just have to ask, the stew doesn’t it soak through the bread? Broths tend to soak through bread more than stews, which are heartier in composition. So the stew will soak into the bread, but generally not through. If your bread has a nice crusty exterior, so much the better. Also be sure to not hollow out too large a cavity in your loaf; this way you’ll be left with lots of gooey, stewey chunks of bread! How do I make the heavy cream? I´m not used to cooking. You can actually just buy the heavy cream in the dairy section of most stores. It should be near the half and half, eggs, cheese, etc. This looks amazing! Just discovered your sight from Westeros. I always enjoy the food references in the books. I have many cookbooks and can not wait to add yours to my collection. Good luck with everything. Oh my goodness I made this and it was fantastic. I used a filet of tilapia along with the cod, and added parsnips and white and sweet potatoes (I have friends with big appetites and I have figured out a lot of ways to stretch recipes). Amazing! Would there be any way to make this in the crockpot?! That’s a good question! I’ve tried googling it, but I’m getting weird answers, unfortunately. I guess try stirring it in. I think it dissolves? Yep! The saffron should at least partially dissolve in the cream, turning it a yellow color. The strands are small enough that you don’t need to strain them out, as they should continue to break down and incorporate into the rest of the stew. This looks amazing, and as someone who doesn’t eat fish, I intend to try coming up with a non-fish vegetarian alternative. I’ll let you know how it works out! And we’ll look forward to hearing how your experimentation goes; one of our Innmates doesn’t eat fish either, so he’s missed out on the deliciousness of this stew. It would be great to be able to serve him a similar dish! 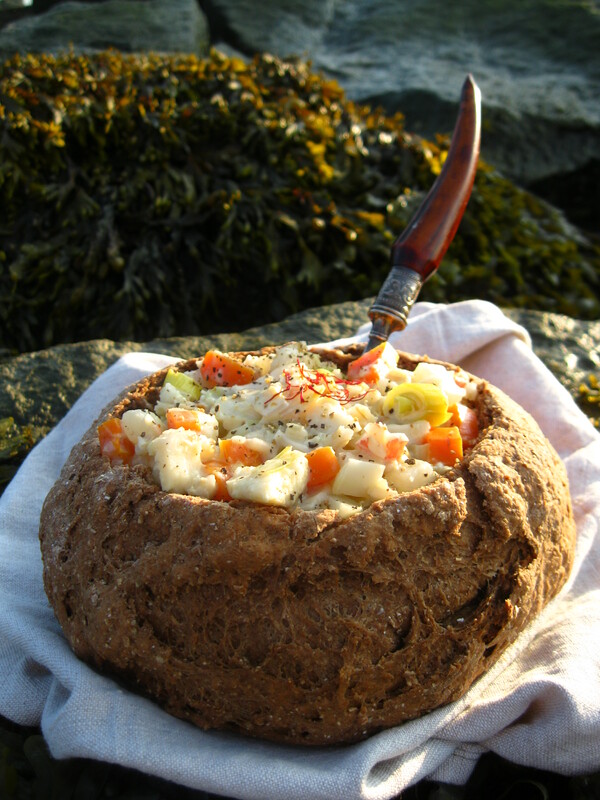 My parents and I all had this with your delicious black bread and we thought it was fantastic. Is it ok to use shrimp and chicken as a substitute for clams and crab meat? I think my allergy reacts faster than normal when I seat clams or crabs, so I’m thinking of mixing shrimp and chicken. I read this part of the book recently and was drooling over the description so when I found your recipe, I immediately decided to try it. I will admit that as I couldn’t find cod I used Whiting fish which was very good. I was afraid my husband wouldn’t go for turnips so I used parsnips instead and I since I didn’t make it home from the store with leeks I ended up using onion. The soup was certainly not very hard to make and I liked the seafood combination. However, I have to say, it was too bland. I will be using leeks and turnips next time to try to help with that, but it needs something more to bring more flavor into play. I ended up sprinkling in Old Bay seafood seasoning at the table. Even though he also thought it too bland my husband refused the Old Bay since that wouldn’t be authentic. I think I will use some celery next time in with the other sauteed vegetables and I may research what is in Old Bay’s so I can add some of those components without violating authenticity for my husband. How yellow is a “nice golden color” ….cause the sample pic looks more white while mine looks yellow…. The cream that you mix the saffron into should turn yellow; the stew as a whole is almost entirely white when it’s finished. hm… must’ve done it wrong or something cause overall my stew was yellowy….maybe it’s cause most of the broth was absorbed during the 20 min period (had followed the instructions exactly and the fish was all opaque at the end so *shrug*). Curious! Mine has come out a bit yellow tinged before, but it sounds like yours was very yellow. I’ll give the recipe another go, and see if it needs a smidge of tweaking here and there. I made this wonderful stew, and the black beer bread along with it. Absolutely delicious, and very hearty. It would be the perfect food if you were coming in from sea, freezing and hungry; thick, rich, and grounding. Thanks so much! I don’t think I’ve ever seen evaporated milk in our stores here in Sweden, apart from possibly some powderized thing I saw in a bag once. What is the special qualities of evaporated milk? Can I substitute regular milk, or more cream, or something like that? I’ve heard that evaporated milk is supposed to taste a bit sweet – maybe I should use lactose-free milk, since that tastes sweeter than normal? Oh wow, I never thought of that! I myself would probably try substituting regular milk. Good luck! Made this on Sunday w/the Bread redux! YUM! Did not use saffron though ($$$) and opted for beef instead of the seafood (crab is not a good idea for me), and instead of evaporated milk I used coconut milk. It was still delish :) Husband went back for seconds! One thing is confusing me…. what is the wieght of half a cup of clam or crab ? roughly 125 g or am I mistaken? Sometimes it gives me a headache to convert in metric system…which is the one I am used to for measuring. Gonna try this one this week-end, have been patient with the weather but the cold is finally coming hence…. I can cook it in good conscience. This dish was super tasty! I can’t wait to make it again. Hi Ladies, I absolutely love your recipes. Me and the Hubby got done eating this dish just five minutes ago. I first had some trouble with it tasting a little bland, but i think it was because I forgot the barley (which I WILL be adding next time). I added a little more pepper and dash of sea salt, a splash of garlic tabasco, a pinch of cream of tartar, and used Salish smoked salt. I also used a parsnip in place of one carrot and though not medieval as far as I know, I feel that it gave needed flavor to the stew. (update after 12 hours) The flavor definitely blooms when it becomes leftovers, God bless my parents for teaching me leftovers night is every night till its eaten. To add to my last post, I (unfortunatly) found out during lunch, my overly picky wont-eat-human-food cat, also LOVES it. So… to be a compliment, you made the hole family very happy with this recipie. I threw some seared scallops in there and quartered baby portobello mushrooms too. AAAAAAAMAZING! I think bulgur would work well. I commented on the main stew/soup page, but just in case that gets missed, you can cook this at least partially via a crockpot if you like, which is especially helpful if you are bringing this over to a friend’s for a watch party! I followed the recipe exactly up through the boil the wine section, then transferred it to a standard large-ish crock pot to cook on high for several hours (basically to cook the turnips and the rest of the fish meat). It did bubble up, so I stirred it and turned it back to low. Flavor was very good but it was not quite as liquidy as I would have liked. I may add a splash of milk to it while reheating the leftovers. Small alterations I may make for next time would be to use about half as much cod (to save a bit of money) and substitute shrimp for clam as I am not a big clam fan. Also add in some mushrooms as well. Overall very good! Has anyone tried this with fish but no shellfish? I’d love to try it with cod and other fish, but without the crab and clams. How would/does it affect the flavor? I just made this today. I couldn’t afford the saffron and I’m living in a transitional housing complex, so no wine either; but I subbed in turmeric for the saffron and sunflower seeds for the barley, and added a bit of bacon because, well…BACON!! Let’s just say I have a new favourite dish. Fueled me all day. Can’t wait to make it again, this time with purple barley.